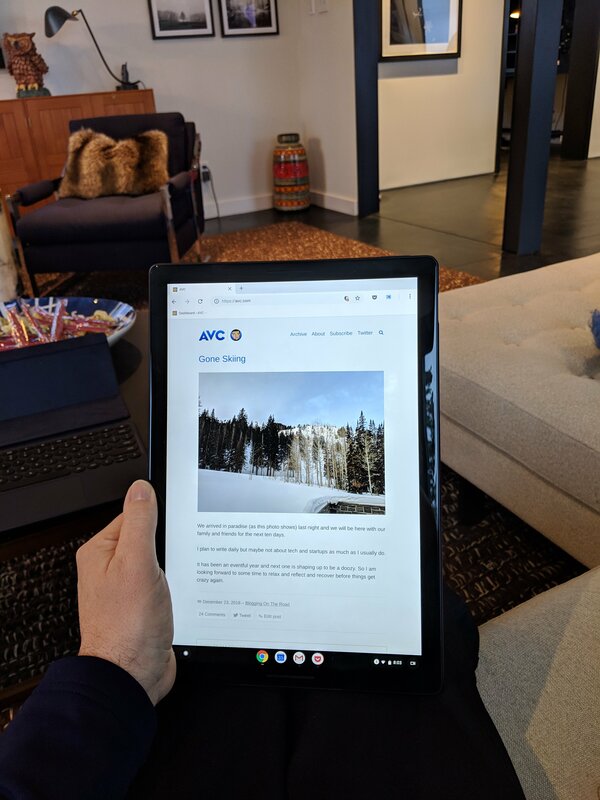 I recently wrote about my new Pixel Slate. There is a lot I like about it and plenty more that I’m getting used to. I touched on most of that in my blog post. I am writing this post on my Slate using the Slate Keyboard (you can see it in the left of the photo below. One thing that I am totally smitten with is reading web content on it. The screen is big and crisp and it feels great in the hands. It’s like a huge phone, which is the device that I have been doing most of my reading on. If you look at the bottom of the screen, you will see four icons; Chrome, Calendar, Gmail, and the fourth is Pocket. I have just started using Pocket. It used to be called Read It Later and it was developed by Nate Weiner. Pocket was bought by Mozilla in 2017. I selected Pocket because both of my daughters use it and several colleagues at USV do too. While I have mostly been reading web content on my phone, I come across it in many places (email, twitter, google discover, reddit, hacker news, techmeme, etc) on all of my various devices . Believe it or not, I have typically stopped what I was doing and read it when I saw the link, or I would email the link to myself and read it later in my mail client on my phone. But now that I have this Slate where I want to try and read all of my web content on, I am drawn to a service that exists on all of my devices (phone, desktop, laptop) and can collect all of the links and let me read them in one place. So I am going to finally try and make the switch to a “read it later” service, something many of you have been doing for years now. 1/ How do you save to Pocket links you come across in Twitter? 2/ How do you save to Pocket links you come across in Google Discover? 3/ Is there a way to save to Pocket directly in Gmail vs clicking on the link and launching in the browser and saving there? So that’s one of the things I am up to on this year end holiday break. I appreciate all of your help in quickly making me a power Pocket user.